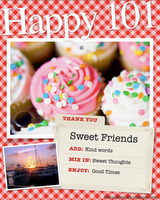 All A Bunch Of Momsense: Happy 101! Ok, ladies. First of all, I want to apologize that this has taken 67 forevers. I am so flattered, and honored, and blessed that you all have shared this award with me, and that was like two weeks ago, and I'm just now getting my post up. Holidays, tax season, life, you know how it is. But, here we go! These things always come with rules. I'm to list 10 things that make me happy, then share this award with 10 others. You know what I like about these? When you list things like Ten Things That Make Me Happy, it makes it nice to know right where that is. You know how it is when you're having one of THOSE days? The ones where you need reminded why you bother? A list like this is fabulous. Doing something with the kids with no fighting. Hanging out with my hubs. Good food with good friends. Now I have to share this award with 10 other bloggers! Seriously. You are my mental break in the day. You tweet fun things, you post great stuff, you share the smiles, the tears, your lives. In the short time that I've been blogging, I've "met" some seriously amazing women. I've laughed hysterically over oomlots, joined the ranks of the Crammer Jammers, waited anxiously on the birth of Bitsy, worried about stomach bugs and halo removals. In the last roughly 3 months, you guys have stepped up and rallied around causes like my own personal fave, the Alex's Lemonade Stand Foundation, and Belli's Mom's current cause, The Bell Center. You've supported each other in goal setting and reaching, from workouts and weight loss to home organization. You've stood up for what you believe in, even when it's been hard to do, and you've helped pick one another up when we're feeling blah. So, y'all, I'm kinda gonna cheat. Because I cannot, in good conscience, select just 10 of you. I can't. So, are you reading this? And YOU have done that for me. So, go forth, grab your award, and share your things that make you happy! What a sweet post. It made me teary, and very thankful that you are my friend. Great post and not a cop-out! Its impossible to choose! Sorry you've been so busy lately! Take care. Sorry this too so long to respond to but I totally think cheating is allowed with rewards :) And love your new button . . .need to get me a button! Hope you are hanging in there. Love the new layout and already added your button to my blog.